One of the more popular explanations people have given for supporting Donald Trump for President is he is willing to stick it to the "GOP establishment" (or "GOPe"). Trump supporters have this belief that he's willing to enact policies which D.C. Republicans are afraid to even broach (e.g. a yuuuuuge border fence, bombing the s**t out of ISIS, etc.). Never mind that many (if not all) of Trump's policy initiatives lack any substantive game plan. Remember, he's the ultimate deal maker. The idea in negotiations is to start with an absurd proposal and then work towards a more palatable conclusion. A President Trump may get a border fence, but he'd have to acquiesce to some Democrat demands such as tax increases, expansion of certain social programs, etc. And he'd be OK with that because, contrary to the popular belief among the barking, clapping seals Trump supporters, he doesn't have nearly as much interest in "making America great again" as he does solidifying his legacy as the ultimate negotiator and deal maker. While Trump supporters refuse to believe they're being played, they're now having to face the realization that their "anti-establishment" candidate actually may not be all that unpopular among establishment types. Over the last 24 hours, Donald Trump and his allies have giddily quoted and cheered on two unlikely figures: Former House Speaker John Boehner and Senate Majority Leader Mitch McConnell. Trump cited McConnell on the stump, attacking Cruz for antagonizing many of his colleagues in the US Senate. And Trumpworld is reveling in on-the-record comments from Boehner, who called Cruz "Lucifer in the flesh," and a "miserable" SOB. The Trump train is ostensibly fueled by anger at Washington's various betrayals, and a rigged system that benefits insiders and elites at the expense of average Americans. But the billionaire's bandwagon is more than happy to embrace card-carrying, central-casting members of The Establishment, so long as they're saying or doing things that are deemed helpful to the 'Trumpstablishment.' Trump supporters angrily rail against Beltway fat cats who "go along to get along" in political fights, then prance from one lavish cocktail party to the next, toasting their own superiority. Then they'll turn around and applaud bona fide establishment fixtures -- from Rudy Giuliani, to Newt Gingrich, to Boehner and McConnell -- while applying that now-meaningless term to conservatives who oppose Trump on policy and ideological grounds. Suddenly "go along to get along" is a necessary and laudable dealmaking virtue, and policy arguments are for uppity, weak-kneed nerds. In 2014, I and many others worked on behalf of (and donated money to) Republican candidates in an effort to regain the majority in the U.S. Senate and tighten the stranglehold on the U.S. House. While both occurred, the "non-establishment" crowd chided us for such efforts, essentially saying they were in vain because the "establishment" would sell out the people. Even if that were true (it's not, by the way), many Trumpkins are now embracing the very figureheads of the very GOPe they have decried from the outset. What's even more rich is that someone like Ted Cruz is now being labeled as an "establishment" type. In an election cycle where conventional wisdom has yet to be conventional, naming a Vice Presidential candidate while being in second place for your party's nomination for President seems to fit right in. Ted Cruz formally named Carly Fiorina as his vice presidential running mate Wednesday -- a last-ditch move to regain momentum after being mathematically eliminated from winning the GOP presidential nomination outright. "After a great deal of consideration and prayer, I have come to the conclusion that if I am nominated to be president of the United States that I will run on a ticket with my vice presidential nominee Carly Fiorina," Cruz said during a rally in Indianapolis. Fiorina joined the Texas senator on stage, and Cruz's staff changed the podium in between Cruz and Fiorina's remarks to display a new logo featuring both their names. "Ted could not be more right in what he said: There is a lot at stake, and in fact, this is a fight, this is a fight for the soul of our party and the future of our nation," Fiorina said. "I've had tough fights all my life. Tough fights don't worry me a bit." While I've always been impressed with Fiorina's business background and compelling personal story, she never really resonated with the GOP electorate despite solid debate performances. I don't know if the Cruz campaign believes this puts Fiorina's home state of California in play for the June 7 GOP primary or what. If that's their belief, that seems rather far fetched given Donald Trump has enjoyed nearly a 20-point lead in most polling. Personally I would have preferred Cruz gone with South Carolina governor Nikki Haley or New Mexico governor Susana Martinez, but what do I know? Sure this is an act of desperation by the Cruz campaign. But then again there's no more cards left to play. After being defeated handily in the Wisconsin primary three weeks ago, Trump has scored six consecutive resounding primary wins while compiling at least 50% of the vote in 5 of those 6 states (he got 48% in Pennsylvania). With Trump's delegate total now sitting at 987, he needs 250 more to reach the 1,237 threshold that would make him the presumptive nominee. But even if he doesn't reach that mark, it's pretty much a cinch he'll get to at least 1,100 while having earned more than 40% of the aggregate vote. Let's face it. If any candidate other than Trump put up those kind of numbers, many of us in the #NeverTrump crowd would be declaring that candidate the presumptive nominee. That said, I still remain firmly in the camp of those who believe there should be an effort to select a different candidate for the GOP nomination if indeed Trump does not have it sown up after the first ballot at the RNC in July. Whenever a similar belief is conveyed, the patented response seems to be "ZOMG, SUCH A MOVE WILL DOOM THE GOP!!!!!!" The way I see it, a Trump candidacy against Hillary Clinton pretty much accomplishes that anyways. Polling shows he's consistently behind Clinton by double digits, he puts the Senate majority in jeopardy and even provides concern that the U.S. House may come in to play. Alas, no matter whom the GOP nominee for President happens to be, it's difficult to see 2016 as anything but a proverbial train wreck for the Republicans. As much as I've loathed the insufferable saga that is "Deflategate" I'm grateful it has at least given us a brief reprieve from the equally tedious NFL draft coverage. A federal appeals court has ruled that New England Patriots quarterback Tom Brady must serve a four-game Deflategate suspension imposed by the NFL, overturning a lower judge and siding with the league in a battle with the NFL Players Association. Brady, however, is not prepared to accept Monday's appeals court ruling and is exploring all his legal options with his attorneys, sources told ESPN NFL Insider Adam Schefter. The decision by a three-judge panel may end the legal debate over the scandal that led to months of football fans arguing over air pressure and the reputation of one of the league's top teams. It is also likely to fuel a fresh round of debate over what role, if any, the quarterback and top NFL star played in using underinflated footballs in the AFC Championship Game in January 2015. The Patriots won the contest over the Indianapolis Colts and then won the Super Bowl. This has been a joke from the start. The idea that under-inflated footballs would result in a $1 million fine, loss of a 1st round draft choice and a four-game suspension of the team's QB is way over the top. In a way, the Patriots have only themselves to blame given the Spygate scandal from 2007. Granted previous offenses shouldn't be a factor in any new wrongdoings, but then the NFL doesn't operate under the same guidelines as the legal system. The 2nd Circuit said the contract between players and the NFL gave he commissioner authority that was "especially broad." I've been saying all along that the NFL Players Association has no one but themselves to blame for the Commissioner's ability to be heavy handed when meting out punishments for player misconduct. During negotiations to end the NFL owners' lockout of players in 2011, the NFLPA focused most of their energy on how the revenue was distributed. That's not to say it wasn't an important issue, but it seems very apparent they didn't give much consideration to player discipline issues. Betcha that that'll be rectified next time the Collective Bargaining Agreement is to be renewed. So what kind of recourse does Brady and the NFLPA have available? The NFLPA and Brady can petition for a re-hearing in front of the same panel and then the entire 2nd Circuit Court or take their appeal to the U.S. Supreme Court, though either move is unlikely and would be a steep, costly and time-consuming climb. They would have to request a stay of Brady's suspension during an appeal. The NFL has the option of implementing the full suspension or attempting to reach a settlement and avoid further appeals. To avoid potential further embarrassment, it's possible Goodell may offer to reduce the suspension to, say, two games. However, there were rumors that Goodell offered to reduce the suspension last year but Brady declined given that such an acquiescence would have implied some culpability on the QB's part. I honestly have no prediction as to how this will be resolved. The whole situation is beyond parody at this point. Houston Astros at Texas Rangers - July 1, 2006. Perhaps one of the single greatest catches ever by a center fielder. Another Sunday, another edition of my Northern Alliance Radio Network program The Closer. The 1-hour blitz begins at 2:00 PM Central Time. I don't know what more I can add about the passing of musical icon Prince, but I'll at least share my perspective of what he meant to me. Also, how did this election cycle wade into the subject of where people go pee? I don't like to throw the word "icon" around too casually. But when an entertainer attains immense popularity among multiple generations, such a label would seem apropos. It's safe to say that the Twin Cities music scene (and the entire music world for that matter) lost an icon. Legendary Minnesota pop musician Prince, hailed worldwide as a versatile musical genius, was found dead Thursday morning at his Paisley Park recording studio complex in Chanhassen. He was 57. The Carver County Sheriff’s Office reported that responders found the artist, unresponsive, in an elevator and were unable to revive him with CPR. He was pronounced deceased at 10:07 a.m.
His body is at the Midwest Medical Examiners Officer in Ramsey. An autospy is planned Friday. In a transcript of a 911 call released by the Carver County Sheriff’s Office, an unidentified male caller tells the dispatcher there is “a person … dead here,” says he doesn’t know how the person died and struggles to find the exact address of Prince’s home, which the dispatcher urgently seeks. Prince had his initial enormous success in the 1980s, which were my formative years. I could hardly turn on the radio in middle school and high school without hearing a Prince tune. The songs 1999, Little Red Corvette and Delirious were the most popular tracks at the Wooddale roller skating rink around 1983-84. And the tunes When Doves Cry and Let's Go Crazy were often part of the soundtrack on bus rides to our away basketball games in 10th grade. Despite his worldwide popularity, Prince always stayed true to his Minnesota roots by living hear when not touring. And while it wasn't touted publicly, his philanthropy was prolific. Yes, Prince's music and his generosity to his hometown are two things which will last for a long, long time. The Republican and Democrat presidential primaries took place last evening. And as expected, Donald Trump and Hillary Clinton prevailed in their respective primaries. - Finishing a distant third behind Trump and John Kasich, Sen. Ted Cruz officially has no mathematical shot to reach 1,237 delegates before the July Republican National Convention. But even before that was official, Cruz has been pressing ahead as though no candidate will reach the 1,237 threshold before the RNC, so this is hardly a death knell for his campaign. - Trump won 60.5% of the vote in New York yet is receiving approximately 95% of the delegates. I'm going to go out on a limb and say he wasn't engaging in his typical bitching and moaning about the process being "unfair" or "rigged." - New Yorkers pitched a fit over Cruz's uncomplimentary phrase of "New York values" yet the winners of the two primaries were a con man (Trump) and a establishment corrupt-o-crat (Clinton). Yep, New Yorkers sure showed us. After mammoth home state win Trump's aggregate share of the national GOP vote rose from 37.6 to...38.2. Pittsburgh Pirates at Cincinnati Reds - April 18, 2011. It's political convention season, so a lot to get to on today's edition of The Closer. The one-hour festivities get started at 2:00 PM Central Time. At 2:15, AJ Kern will check in via phone. Ms. Kern is challenging current MN 6th District Congressman Tom Emmer for the Republican endorsement in CD6. Time permitting, we'll also look back at the week in presidential politics. That's because they're without a "win." Seriously though, how is that a team with such high hopes going into the 2016 season can start 0-9? How about through nine games they're hitting .076 with runners in scoring position. Says it all, doesn't it? - For far too long, Republican National Committee chairman Reince Priebus has allowed the boorish Donald Trump to embarrass and degrade the party. Yes, I know. The GOP "establishment" has blood on its hands with the way they've conducted themselves in the past, which is part of the reason a Trump campaign has resonated. Please spare me that tedious, asinine and unoriginal narrative. Even if the GOP "establishment" has failed us in the past, a Trump-ish "cult of personality" is not a solution. Given Trump's larger-than-life persona, party officials have been hesitant to call him on his misinformation campaign, specifically Trump's flat out erroneous assertion that "party bosses" are attempting to steal the nomination from him. Chairman Priebus rightly laid out the rules that whichever candidate secures 1,237 delegates before the July Republican National Convention is the presumptive nominee. Period. But if no one reaches the 1,237 threshold, there will be a second ballot at the RNC where delegates are allowed to vote for whomever they desire. But WaPo columnist Jennifer Rubin rightly points out that Priebus needs to take it a step further and call out Trump's erroneous statements and boorish behavior. Priebus continues to passively allow Trump’s torrent of deception, threats and out and out lies wash over the party, treating him as just another candidate. It was this attitude that sent Priebus scurrying to Trump Tower with the pledge, now shown to be entirely worthless. Priebus’s collapse into moral relativism led him to forgo speaking out against the vast majority of Trump’s outrageous comments, and to only cryptically frown on violence in the race, which Trump alone has instigated and condoned. Worse yet, without an operative moral compass, Priebus again and again praised the entire field and provided assurance that no matter who got to 1,237 delegates, the entire party would get behind him. In short, he offered Trump carte blanche and now stands accused of running a corrupt and undemocratic outfit. You would think he would show a smidgen of indignation. Legit GOP presidential candidates like Marco Rubio and Scott Walker didn't really go on the offensive against Trump until it was too late. With that in mind, RNC officials can't afford to continue to let Trump control the narrative. It's easy for Trump's spin to play given the media would much rather run with a "Trump was cheated story" than take a few minutes to lay out the simple process of how an open convention works. - So Tuesday was "Equal Pay Day." The purpose of this was to call attention to women apparently not receiving the same pay as men. The most common statistic I've seen is women only make 71 cents for every dollar a man earns. Suppose for a minute that is an apples to apples comparison (it's not, but work with me here). Why would a company ever hire a man if they could pay a woman nearly 30% less in salary for the same work? - Former New Orleans Saints defensive end Will Smith was shot and killed in an apparent road rage incident in New Orleans last weekend. He was only 34-years old. With emotions still pretty raw, Sean Payton, Smith's head coach with the Saints, went on an anti-gun tirade. In the aftermath of the senseless shooting Saturday night that left former defensive end Smith dead – and Smith’s wife, Racquel, wounded -- amid a beef linked to a traffic accident, the New Orleans Saints coach is pleading for more gun control. He isn’t merely talking about tighter laws. If Payton had his druthers, we’d live in a country without guns. Look, gun control demagoguery is hardly a new thing in light of a tragic shooting. Unfortunately, misstatement of facts is also commonplace. Since this interview with Payton was conducted in less than 48 hours after Smith's death, I'm willing to give him a pass. With that said, it would behoove any gun control zealot to listen to Arizona Cardinals CB (and New Orleans native) Tyrann Mathieu on what could be done to alleviate that city's violent crime rate. Hint: Banning all guns certainly won't eliminate the major issues the city endures. Arizona Diamondbacks at Los Angeles Dodgers - July 5, 2004. In this game, Dodgers closer Eric Gagne blew the save opportunity. This ended a streak of 84 consecutive successful save opportunities, which is still a MLB record. Hey, your income tax returns aren't due for another five days, so you've got time to tune in to the Northern Alliance Radio Network this afternoon. My one-hour program begins at 2:00 PM Central Time. Right at 2:00, MN state representative Abigail Whelan (R-Anoka) will check in. Rep. Whelan has made some waves in response to the University of Minnesota's medical research on tissue from aborted fetuses. We may also discuss other goings on, such as a proposed Northstar Rail expansion, banning of "non-essential" travel by government employees, etc. In non-guest segments, I'll get into the latest in presidential politics where it's becoming increasingly likely that July's Republican National Convention will be an "open convention." As such, front runner Donald Trump and his supporters are becoming insufferably whiny. Seriously, can you spot the error put forth by Donald Trump's kid? This is what happens when non-witty people try to engage in repartee, which is another trait of his old man's presidential campaign. 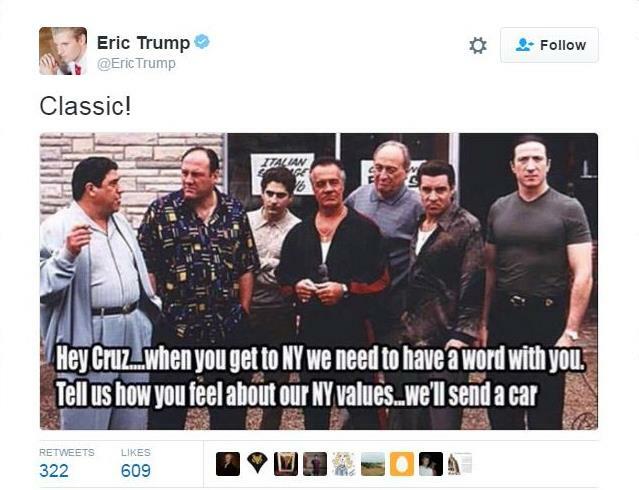 The pic Eric Trump posted was of the fictional crime family The Sopranos, who hailed from New Jersey. Someone was kind enough to provide a picture tutorial for young Mr. Trump. Forgive the lame puns in the title of this post. I guess I got caught up in the spirit of last night's focus being on the state of Wisconsin. Senator Ted Cruz soundly defeated Donald J. Trump in the Wisconsin primary on Tuesday, breathing new life into efforts to halt Mr. Trump’s divisive presidential candidacy and dealing a blow to his chances of clinching the Republican nomination before the party’s summer convention. Exit polling in this particular primary seemed to dispel a popular chanting point among Trump-kins that the "GOP establishment" is the main group of Republicans who oppose Trump. I'm guessing Trump's attack on popular Wisconsin governor Scott Walker last week was a key factor in galvanizing conservative support for Cruz. If Tuesday's numbers hold, Trump will have a total of 743 delegates to to 517 for Cruz. Yes, it seems pretty certain there will be an open convention come July, and that has turned the Trump campaign into poo flinging monkeys. First off, to accuse the Cruz campaign of violating FEC laws would technically constitute slander if indeed said accusation were untrue (and it most likely is). Second, this idea that the "GOP bosses" are pushing Ted friggin' Cruz to be the nominee is absurd on its face. It's a clear indication that the Trump communications team is utterly clueless about the dynamics of the Cruz-"GOPe" relationship, Finally, there's a coordinated effort to "steal the nomination" from Trump? Really? There's no possibility that Trump's ineptitude, slander, lack of organization and buffoonish behavior has any bearing on this at all? Voters who made their decisions late once again broke sharply against Mr. Trump, who sustained a series of self-inflicted wounds in the last week: A third of voters settled on a candidate over that period, and of those, 46 percent said they backed Mr. Cruz. Only 29 percent embraced Mr. Trump. Most striking was how many Wisconsin primary voters still harbored deep discomfort with Mr. Trump despite his wide lead in the race for delegates. In exit polls, 58 percent said they would be “concerned” or “scared” if he were elected, higher than the other two Republican hopefuls. And 37 percent of those who voted in the Republican primary said they would support Hillary Clinton, a third-party candidate or no one at all if Mr. Trump were the nominee. There are 16 states remaining to hold Republican primaries, with the majority being closed primaries (i.e. only registered Republicans are allowed to vote). This means that committed Republicans will be casting votes, which has favored Cruz in prior contests. However, more than half the states involved are on either the east coast or west coast, so Trump may have an advantage as those Republicans tend to be more moderate. In Monday evening's NCAA men's basketball championship, North Carolina's Marcus Paige made this incredible shot to tie the game with 4.7 seconds remaining. Definitely hard to top a shot as clutch as that, eh? Well, Villanova's Kris Jenkins managed to do just that. In one of the most memorable NCAA basketball championship games ever, Villanova wins its first title since their miraculous 1985 run. So would you consider this finish the most memorable in the history of the NCAA men's tourney? For my money, the plucky 1983 North Carolina St. Wolfpack's mammoth upset of the Houston Cougars is still tops. Since it was Opening Day yesterday, let's look back at the 1988 opener when the New York Mets took on the Montreal Expos. The Mets hit 6 home runs this game, which is an all time high on Opening Day. 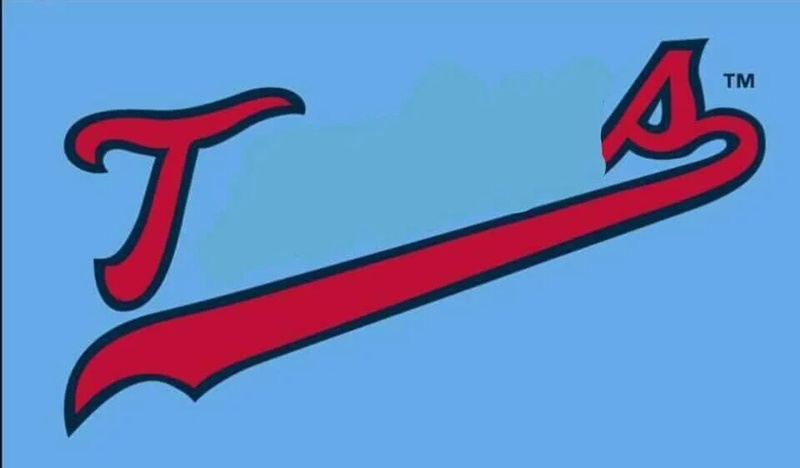 Happy Opening Day of Major League Baseball!! While there's a lot to talk about on the MLB front, there are other issues to get to on today's edition of The Closer. The 1-hour extravaganza begins at 2:00 PM Central Time. Right at 2:00 I'll be joined by long time friend of the broadcast Julia Erynn of Alpha News. This past week the MN Legislature addressed the issue of the University of Minnesota purchasing fetal tissue from an abortion clinic, a story AN broke last fall. Julia also reported Wednesday on the announcement from Hennepin County Attorney Mike Freeman that he would not pursue charges against two Minneapolis police officers in the killing of Jamar Clark last November. Then at 2:30 I welcome to the studio Miss Brainerd Lakes Danielle Hron. A medical student at the University of Minnesota Twin Cities Medical School, Danielle is passionate about improving access to healthcare. We'll also discuss an upcoming fundraiser Danielle is organizing to benefit the Children's Miracle Network Hospitals as well as her prep for the Miss Minnesota pageant in June. As a Republican voter, I've made no secret of my concerns with this election cycle. Not only is the golden opportunity to win the White House now in peril for the GOP, the U.S. Senate may yet be lost. Worse yet, the largest Republican majority in the House of Representatives since the Great Depression may slip from the GOP's seemingly iron clad grip. Yes, Republican presidential front runner Donald Trump has had that much of a negative impact on the electoral landscape. And while 2016 may well be a lost year for Republicans electorally, Philip Klein paints an even more depressing picture for the party. Republicans haven't proven that they can boost white turnout enough in presidential election years to win now; and a critical mass of their primary electorate doesn't want to rebuild the party to make it more welcoming to minority groups. Consider a few data points. In the nine presidential elections between 1972 and 2004, Republican candidates won the six times that they were able to win white voters by double digits, and lost the three times that Democrats were able to keep the GOP advantage with the white vote to single digits. But in 2008 and 2012, the pattern broke. President Obama was able to win overwhelming victories even though he lost the white vote by double digits both times. In fact, in 2012, Mitt Romney won white voters by 20 points – the same amount as Ronald Reagan did in 1980. Yet Reagan won 44 states, and Romney lost. The difference was that in 1980 whites comprised 88 percent of the electorate, and in 2012, whites accounted for just 72 percent of voters. For Republicans, it's a vicious cycle. They lose non-white voters overwhelmingly, and then, because few minorities vote in their primaries, they end up producing candidates who have no realistic chance to appeal to those voters. The racial makeup of their primary voters still looks like the general electorate that voted for Reagan in 1980, even as the country has moved on. The number don't lie. As such, they invalidate the utterly moronic (not to mention blatantly false) assertion that Trump will appeal to non-traditional Republican voters. Still, there are those Trump apologists who say it's the "GOP establishment" who is to blame for the Trump revolution. I don't know if it's that simplistic, but I feel as though David Frum put forth an accurate summary. What we on the right have yet to grasp is that more conservative policies were not going to be passed within 2-3 election cycles of President Barack Obama and a Democrat dominated Congress pushing through Obamacare. While I was thrilled with the advent of the Tea Party in 2009, I was concerned that many who first got into the political game would expect immediate sweeping reforms after the GOP groundswell in the 2010 midterm elections. And while Republican legislators elected to Congress over the past few election cycles have been more conservative, they apparently didn't act fast enough for the insurgents. This is one area where the left has killed us, in that they were willing to play the long game and thus kept hammering on issues like healthcare reform, gay marriage, climate change legislation, etc. They didn't become weary in the face of electoral setbacks. While the diversity and quality of 2016 presidential candidates on the GOP side was arguably its best ever, there's no question that we have to make our message more appealing to a more diverse set of voters. The best time to have started such an outreach would have been out 20 years ago. The second best time? Right now!! !